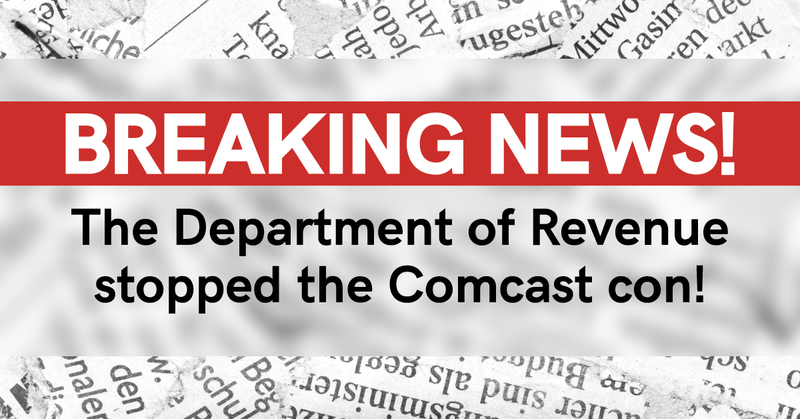 This week, the Oregon Department of Revenue decided to reject Comcast’s tax con — and you helped make that happen! The Coalition for Corporate Responsibility — a group of consumer and tax policy organizations that includes the Oregon Consumer League, Tax Fairness Oregon, The Oregon Center for Public Policy, and OSPIRG — submitted a petition that you, and about 2,000 other Oregonians, signed, urging the Department of Revenue to reject Comcast’s appeal. The Director of the Department heard you loud and clear — this week’s ruling declared that Comcast’s “Gigabit Pro” service does not qualify for a tax break meant to bring affordable, high-speed internet service to Oregonians. We want to thank you for making this decision happen, and for making sure that large and out-of-state corporations like Comcast pay their fair share! For years, Comcast convinced the state that it did not provide “data transmissions services,” which allowed them to avoid paying millions of dollars in property taxes in Oregon. In 2009, the state finally wised up and ruled that of course, Comcast’s internet and VOIP services did constitute “data transmissions services” and they would have to pay “centrally assessed” property taxes, just like every other telecom company in the state. Comcast appealed that ruling and for five years has been fighting in the courts to avoid paying its fair share. Since 2009, Comcast has accrued more than $120 million in unpaid property taxes! Imagine what Oregonians are being deprived of, all because Comcast won’t pay what it owes. Think of what $120 million could fund, think of all the teachers or public safety officers who could be hired, the seniors who could finally access the services that they rely on, the bridges and roads that could be improved. Comcast made $8.2 billion in profits last year; it doesn’t need any more subsidies. But Oregon needs Comcast to pay its fair share. We’ve stopped the Comcast con. Now we need to tell Comcast, it’s time to PAY WHAT YOU OWE!